Happy Friday everybody! How are you adjusting to Daylights Savings Time? The first few days is always rough for me missing an hour of sleep, but I can't lie - I love the extra daylight until 7 p.m. If this is your first Friday First please click the image above or on the side bar for more information. Last week's Friday Firsts had a couple new participants! Nicole of Healthy Chow joined us and submitted her C.R.A.B. muffins made with brussel sprouts! I thought they were really cool, I've never heard of baking with brussel sprouts, only zucchini! I especially loved the healthy bits of bright green peeking out in the final product! 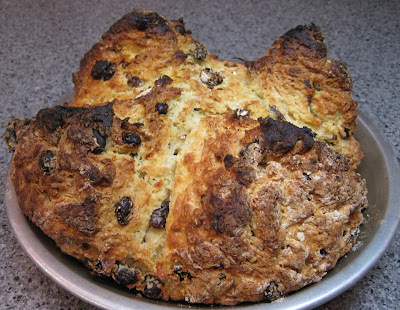 My first for this week was Irish Soda Bread! Not only was this the first time I've made Irish soda bread, but it was also the first time I've ever baked bread from scratch (unless you count banana bread)!!! I felt mighty proud of myself to see it come out of the oven all cracked open and "authentic" looking! To participate in Friday Firsts create a blog post featuring a "first" of yours. It could be the first time you've tried sushi or the first time you've eaten at a certain restaurant! Any culinary first will do! Next, link that blog post below and tell us about it! If you don't have a blog or a specific post to link to please tell us about your first in the comment section! Any and all participation is welcome! Used my mandolin for the first time and I still have all my fingers!! I've only made soda bread once a long time ago. I must try doing it again. Yours looks great - I'm sure it was delicious! Thanks for participating Laura and April! Laura I'm intimidated by mandolins! If I had one I'd definitely use the guard, I'm so paranoid about slices! April, the cake looks divine! I took a whack at making peanut butter granola bars. They tasted great but didn't stick as well. I love mandolins! Although I have to confess that I don't often use ours because I'm a lazy cook and a knife is easier to clean :P But for something like ratatoullie (sp? ), a mandolin has no equal! Nice job with the bread - it looks perfect! That bread looks amazing will foreward it to my wife since she is the baker in are house. I am sorry I missed Friday Firsts last week - with my birthday, I had a crazy work day and with our exchange dinner - it was a crazy day! I plan on submitting my homemade ravioli's this week though - they turned out so good! Hope the snow is melted by you - its almost gone by me and I was able to walk outside at lunch today with just a jacket!